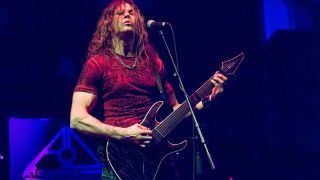 Upon his departure from Megadeth in 2014, shredder supreme Chris Broderick didn’t waste any time getting back on the metal horse: he formed supergroup Act Of Defiance that same year, who dropped their debut, Birth And The Burial, in 2015. The band - which counts former Megadeth drummer Shawn Drover, Scar The Martyr singer Henry Derek and bassist Matt Bachand (Shadows Fall) among its line-up - is now gearing up to unleash second album, Old Scars, New Wounds. Broderick’s formidable skills are in full force throughout, as he tears up the fretboard on his signature Jackson with typically fluid runs, rapid-fire tapping and “a few new techniques” along the way. Given a career that encompasses one of the biggest metal bands of all time, as well as stints with Jag Panzer and Nevermore, Chris certainly has some valuable experience to share with aspiring players. “If you are playing the guitar for any other reason than the love of the instrument, you are in for a lot of frustration. I remember playing in a local band that was doing pretty well, and all of a sudden, one of the members just up and quit. “It’s a great idea to want to be a great guitarist, however the overeager forcing of your technique before it’s ready can cause a lot more problems than it solves. “Sometimes you might not get a gig that’s the perfect fit, but it leads to so many possibilities. “Let the people offering you the opportunity make the determination about your fitness for the position offered. “Just like in any job, a lot of times it comes down to who you know and not what you know (unfortunately) [laughs]. Old Scars, New Wounds is out on 29 September and available to preorder via Metal Blade Records.